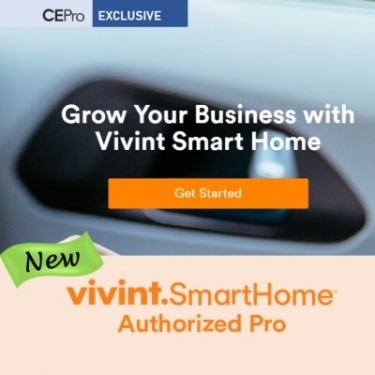 Vivint Smart Home has a new opportunity for home technology pros that is one of the most enticing business propositions I’ve seen in the channel for a very long time. This Utah-based smart home and security giant is offering its products, services, people, and wealth of other resources, including the formidable Vivint brand, to third-party integrators through a new program called Vivint Smart Home Authorized Pro. Participants can offer Vivint’s well-regarded security and smart home products to their customers, along with professional monitoring and interactive smart home services … and leave everything else to Vivint. Vivint carries the products and installs the systems usually within a day, sometimes same-day (even in Jonesboro, AR, Ivie boasts), thanks to more than 2,000 Vivint techs on the ground. The company provides professional installation, zero-interest financing for products, 24/7 customer care, ongoing field service, product warranty, billing and collections, and a million other things that remove pain points for so many home-tech pros. Vivint covers 98 percent of U.S. zip codes, the company claims, and maintains proper insurance and licensing for its technicians in each jurisdiction by closely monitoring regulatory activity. They recruit, train, and nurture technicians and manage quality through post-install customer surveys. Vivint does all of the marketing and the other heavy lifting on the back-end that confounds most integrators. Vivint's team of roughly 2,000 'Smart Home Pros' install the security and automation systems offered by Authorized Pros, often on the same day of the sale. Vivint Authorized Pros enjoy all these riches and a cherry on top: a revenue share for all products and services sold for as long as a customer remains a Vivint subscriber. If a client adds sensors, cameras, or door locks to their Vivint ecosystem down the line, the original Pro still earns royalties on all of it, without lifting a finger. If Vivint launches some fancy new service like Vivint Car Guard for connected vehicles (starts at $10 per month), then the referring pro gets paid every month for any client that subscribes … again, without lifting a finger. All the while, Vivint fights to keep clients – theirs and yours – happy enough to keep on subscribing through ongoing engagement. The Vivint program provides the recurring revenue (RMR) opportunity our channel has coveted for eons, without the risks and uncertainties of a home-grown security practice. The revenue share, by the way, is more generous than I would have imagined, especially given the paltry demands of the dealer (just offer the stuff), and the potential foreverness of the rewards. To be sure, Vivint is fully invested as they want happy customers (especially your customers) that regularly add new stuff to their ecosystem and continue to pay for monitoring and interactive services. Vivint is betting that independent dealers will provide vital local relationships that drive new business and delight customers over the long term. Ivie should know. He spent five years at Control4, most recently as director of channel programs. Before that, he was director of national sales for TruAudio, another custom-centric vendor. And before that he founded and ran an integration company for years. Because of his experience in the custom-install business, Ivie was enlisted by Vivint president Alex Dunn to provide insights into the “CEDIA channel” late last year. Ivie proposed a “Pro Channel” program that Dunn and chief revenue officer Todd Santiago embraced right away. They hired him after the first meeting and here we are: The Vivint Smart Home Authorized Pro program officially launches today, with several CE Pro 100 integrators already on board. The Vivint Pro program ticks all the boxes, with a strong product line priced for mainstream households, installed by an efficient “white-glove Vivint field team,” and supported by a big honkin’ service machine back at Vivint HQ. Vivint is all too happy to do that because, try as it may, the company can’t reach every single household in every neighborhood. “We know the tremendous value of working with professional integrators that know the customer and the technology, and are already in the home,” says Vivint CEO Todd Pedersen. "We have an incredible platform. You all have great brands. Let's build value together." Vivint is one of the smarter companies in my personal book of Who’s Who in the smart home industry. If you don’t know the company, it’s hard to look past the army of “direct-to-home” sales professionals in communities nationwide. "Some companies that have been doing security for years say this model is more profitable because Vivint provides all of the customer service." This army, along with Vivint’s entire sales organization, sells and installs more than 300,000 smart home security systems every year. These aren’t just a bunch of college kids flitting from door to door. Vivint’s sales training might be the eighth wonder of the world. I am not into that kind of thing, but I was riveted by a session I attended many years ago. It was scientific and methodical, honed from 20 years in this business, and updated by the day based on new evidence from the field. It inspired me to motivate someone, anyone, in our industry to create a sales-driven organization like Vivint’s. What amazing things could be done with such a beast? How would it revolutionize our industry? No takers so far, but I do continue to urge business owners to sneak into some of that fine Vivint training. Vivint Authorized Pros won’t have to do any sneaking. They get a free pass. In fact, they must attend the training to join the club. Several early Pros have done the work, earned the Jersey and collected their first checks. Vivint provides a pro-channel marketing tool kit, POS kiosks, demo systems, everything you would expect from a top supplier in the channel. The company is serious about the success of its extended family. So, what are home tech integrators doing with this opportunity? What kind of companies join up? Dealer profiles and business models run the gamut, Ivie says. “Some companies that have been doing security for years say this model is more profitable because Vivint provides all of the customer service,” Ivie says. Others are traditional home technologists with an emphasis on audio/video, serving clients who want to add security. Specialty A/V shops are a great fit, Ivie suggests. Currently, Vivint products don’t integrate with third-party control systems, but the company is not necessarily opposed to such a thing. That doesn’t bother John Campbell of Hometronix – the Jonesboro, AR, integrator mentioned above – who plans to use the Vivint program to tap new markets. A licensed security dealer himself, Campbell already pitches security on every integration job. Ping indoor camera with two-way talk and one-touch call-out. See Julie, I did my “homework” with just a few clicks of Google to read their public disclosure. Now why was that too hard to report? Nice “puff piece”. Where’s the critical analytical reporting? If Vivint has/does everything you laude, including a phenomenal sales training program and employee recruitment, why the change in strategy? 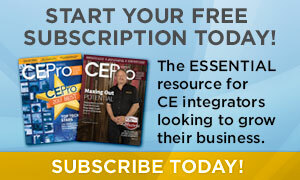 Why do they need to recruit commissioned independent sales people (AKA CEDIA or other dealers) to push their products? Have they saturated the door-to-door scorched earth pushy sales strategy and need fresh meat? Have they run out of pimple-faced fresh young recruits to indoctrinate in their formulaic selling like the dictionary college kid crews of years gone by? Have they seen the lurking competition of $10/month no-contract monitoring of Ring and the open architecture new DIY/GAFA solutions from Nest, SimpliSafe, and Abode treating to eat their proprietary lunch? Anyone excited by this this should think “If the only thing I have of value is my customer relationships” what other products or services, that might be even more lucrative, should I prostitute myself to sell for a “hands-off take-the-commission and run” approach? Agreed, neat to see from an RMR standpoint, but until Vivint and 2Gig are compatible with Control4, their alarm panels are direct competitors to the ones we provide that are compatible, so we do not recommend them. This sounded like a manufacturer written promotional advertisement. Putting aside the lack of 3rd party control support, which is a primary driver of custom integration companies. Vivent like AT&T have horrible customer reviews and would certainly put us in a bad position with our clients. I suppose for trunk slammers who just want to drive away after a job this is ideal.